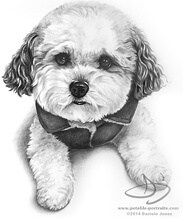 Commissioning a custom pet portrait from Petable Portraits is easy. Email me your photo(s) and tell me the size and if you'd like a drawing, color drawing or painting. Make a 50% deposit below or I can email you a PayPal invoice. Email me. Send photos. Ask any questions. Tell me stories about your pet. I will make recommendations based on your photos. I don’t upsell, I suggest options based on what I think would make the best final portrait of your pet. When you feel confident with your choice, make a 50% deposit below or I can email you a PayPal invoice. I'm happy to do custom sizes - just mention it. Adding an additional pet is $75 and may not work for smaller sizes. Full or complicated backgrounds add $75. I'm always up for a challenge, so I will consider any ideas you might have. These are the most "painterly" of the portraits. 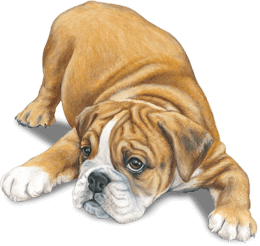 Lifelike and engaging, they are painted with acrylic paint which looks indistinguishable from oil paint, but without all the harsh chemicals and lengthy drying time. 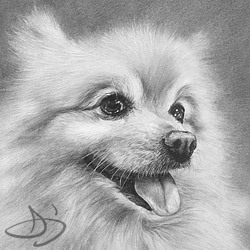 For these lifelike drawings I use colored pencil, watercolor, and sometimes ink. The color brings your pet to life and background colors can be customized. Drawn using graphite or charcoal, these drawings have a classic, timeless quality and can look modern or traditional depending on the frame style and decor.